The coin laundry designer grew up in an old haunted house on Cape Cod full of antiques, giving her an appreciation for craftsmanship and vintage style. Now living in Bozeman, Montana, she designs and hand screen prints each item using water based inks and all natural solvents so each one is unique and environmentally friendly. 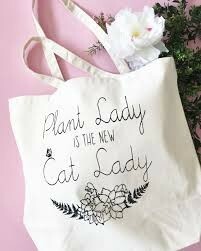 The plant lady tote is a heavy duty gusseted canvas bag measures, made with natural canvas and hand screen printed with Earth friendly water based inks and solvents. 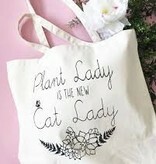 Perfect for hitting up the garden store or picking up yet another bag of kitty litter.